Live for a while in the books you love. Learn from them what is worth learning, but above all love them. This love will be returned to you a thousand times. Whatever your life may become, these books — of this I am certain — will weave through the web of your unfolding. (Rilke, 1903 – Letters to a Young Poet). Like many young people, when I left home and attended college, I did not often attend church. It wasn’t that I was uninterested in things religious, but because I could not find a place that felt at home. For a while I attended a Presbyterian church just off campus, but soon grew leery of a church that unequivocally supported racial segregation. From time to time I visited the Duke Chapel, which was really a cathedral in the center of campus, but that too seemed cold and impersonal, and the various campus groups did not really suit me either. However, beginning my sophomore year I began meeting with some other guys reading various theological books and talking about them. Some of us had become involved as volunteers in a youth organization known as Young Life, and others were just friends. What bound us together was a desire to live out our faith in clear and concrete ways. The books we read were chosen because we thought they would help us move toward that goal. It was in that group that I first came in contact with Dietrich Bonhoeffer’s The Cost of Discipleship, a book that rocked my understanding of what it meant to be a follower of Jesus. 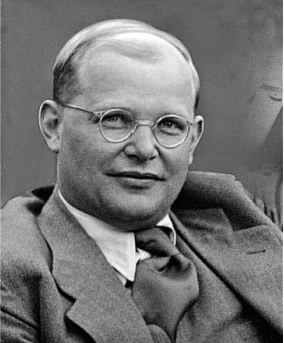 Dietrich Bonhoeffer was born in 1906 and grew up in a prominent, wealthy family in Berlin, Germany. At an early age young Dietrich expressed a desire to be a Lutheran pastor. He went on to earn his PhD in theology and then pastored German speaking Lutheran churches in Spain and other places throughout Europe. At the age of 25 he returned to Berlin to teach at the university there. In 1937 in the midst of the rise of Adolf Hitler and the Nazi party, he wrote The Cost of Discipleship. While it was not his only book, it is the book for which he is best known. Bonhoeffer spoke out against Hitler and eventually led an “underground seminary” for The Confessing Church, a group would-be pastors opposed to the Third Reich (a life-threatening stance to take). In 1940 he was forbidden by the government to speak in public and in 1941 he was banned from writing or publishing. As early as 1939 he made contact with the anti- Nazi resistance. In 1943 he was part of an unsuccessful plot to assassinate Hitler, and was imprisoned in a concentration camp, where he stayed until he was executed shortly before the war’s end. For Bonhoeffer, given the trajectory of his life, these words were not mere spiritualisms we often hear in sermons, but rather a literal calling to give his life in the cause of justice and peace. The cost of following Jesus for him was total and complete. In 1930 Bonhoeffer came to Union Seminary in New York and could have stayed but the turmoil emerging Germany compelled him to return home. Then in 1934 he went to England to pastor a German-speaking church, but then was called back to head the underground seminary of the Confessing Church. 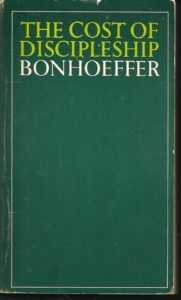 In 1939 he returned to New York, and as the German troops were moving across Europe, Bonhoeffer was urged by colleagues and friends to remain in the United States, but chose to return to Germany. At many points he had the choice to remain safe and secure as a prominent academic, and yet each time he chose the path of costly grace, a path that eventually cost him his life. Our lives count not because we become famous or wealthy or well known for some accomplishment. Bonhoeffer reminds us that our lives count because God has chosen us be His/Her hands and feet and mouths and hearts in a world wracked by suffering, violence and injustice. Our lives count because we are called to follow Jesus into the places where injustice, oppression, indifference, suffering, violence and greed break the heart of God. Our lives count because we are the recipients of a costly grace that bids give our lives in service to others. Today we live in times where the word “Christian” has often been associated with judgmentalism, rigidity and rejection of the “other.” Too often the grace that is offered comes with strings attached regarding one’s political views, lifestyle or sexual choices. Too often on both the left and the right we have cast Jesus in our own image. However, Bonhoeffer’s The Cost of Discipleship reminds us that the way of Jesus is an alternative path, a path of love and a commitment to the poor, and a passion to see peace and justice in all places. Bonhoeffer reminds us that such love and passion comes with a cost, and in choosing to follow Jesus we become partakers of a costly grace that is well worth the price. Drick, Just what I need to hear today. The effort to continually grow in the ways of Christ and letting go of my need for personal well-being is often present. Yet each time I forget about my needs and focus on what God says do, I am content. Continued thankfulness for your work.